This is a first. I am writing this letter to you from my economy seat on the plane back home from China. That is right – I didn’t say Japan. 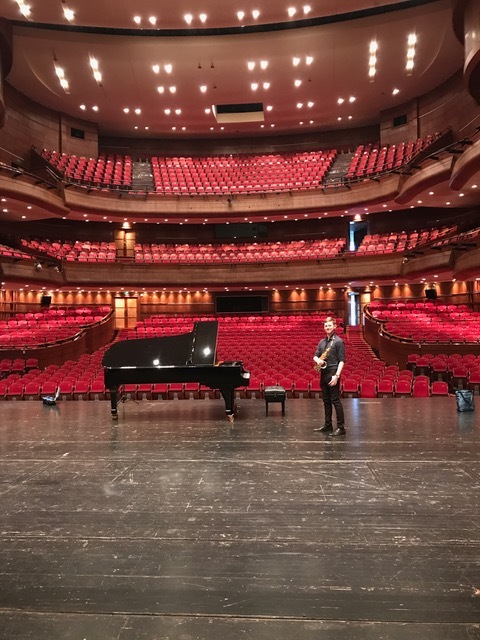 I have been on the road playing duo concerts — piano and alto saxophone — in 13 different Chinese cities over 19 days door to door. Yes – it sounds nuts – and it might have been. Except that the music- making has been so gratifying, and that we got to travel throughout the South and East of China with a perky translator/tour manager. This trip contained so many surprises and challenges and rewards and so much exhaustion that it is taking some time to sink in. And then there are the roads. The basic rule of thumb is that the bigger car or truck has the right to do what it wants. So for example, our mini-van would bully its way to a win in any confrontation with a smaller car, or ubiquitous scooter, bicyclist, or pedestrian, even if we were making a left turn in front of oncoming traffic — which all our drivers routinely did in all the cities we visited. They could feel safe that the motor scooters would stop, even if they were bearing down on us, because we were bigger, and because we had honked at them. We gave way to bigger trucks. Each morning we would be dropped at another beautiful new high speed rail station. There are some differences with the high speed trains I am familiar with in Japan. A ticket for a 2-1/2 hour trip from Kyoto to Tokyo would cost $125 one way in Japan. In China, an equivalent ride would cost $25. In the US it would cost billions and billions, because we still don’t have a high speed rail yet !! On the trains in Japan they are very strict about turning your cell phone to silent mode – insisting that if passengers need to talk they step out to the space between the cars by the train bathrooms. In China it is comically noisy. People watch videos on their mobile phones with the sound blaring. People talk on their phones everywhere in speakerphone mode. Groups of people on the train shout to one another a few seats away – and everyone seems perfectly happy to be eating and moving about amidst the lively commotion. Not that I minded at all – It helped me see how unaware I have been that I too often see people as “other.” Finally it seems like something that we can understand better and train our minds to work with and overcome. I am just sayin’ that over and over again, without a common spoken language, that patience, eye contact and a smile helped me bridge some gaps. A former Israeli student of mine at NEC, who is an excellent classical pianist (and who was studying jazz piano with me) has been working with a management company in China that books mostly classical musicians from the US throughout China. This year, with a newborn at home, he wanted to take a break and recommended me to the Chinese agency. The US has only 10 cities total with more than one million inhabitants; China has 160 cities with more than a million. They have 16 with more than 5 million. US has one. The government there has built impressive concert halls in all of these cities. These are halls that can stage large operas and symphonies. Backstage, there are row after row of dressing rooms and huge areas for stage sets. These halls can seat 1000 people. Don’t worry, we never drew that many people; more like 500 or 600 on the weekends and 250 during the week. But that is still about 230 more than we draw at the Lilypad in Cambridge at my monthly Wednesday gig there. I have never felt that the amount of people at a gig mattered to anyone except my ego. We were told that our fees, and the staff and management salaries of these halls, had already been taken care of by the Chinese government, relieving any pressure to pack the house. We played jazz standards and some of my original tunes. Playing without a bass and drums presented some challenges but also some opportunities. The possibility to shape and more singlehandedly control the textures of the music and a greater responsibility to drive the energy in a supportive way behind the marvelous young alto saxophonist I traveled with was a lot of fun. Nathan Reising, the saxophonist, has just completed his first year of graduate school at NEC. Playing with him — being his rhythm section —was like driving a sports car: He responded instantly to everything and every nuance. Nathan has a great sound and a commitment to playing and swinging melodically in a more traditional mainstream-jazz way, which helped make our music immediately accessible to our audiences, many of whom, we found out, had little jazz exposure. I had my 25 years of playing solo piano at the Four Seasons Hotel behind me, where I learned how to get a full sound from the piano by by using the left hand to keep the rhythm and harmony moving. I was also very grateful to be able to play a few lyrical ballads each night and in this way to be inside the space of a sound created on a responsive concert instrument within an acoustically spectacular hall. Our encore was always a traditional Chinese folk song, Colored Clouds Chasing the Moon, which always surprised the audience and which they greeted with applause. Life on the road: another story! Wake early – car travel to train station – arrive a new city – meet new driver, check in at hotel – sound check – concert – sleep – repeat. We had an adorable translator/tour manager who traveled with us — 24 year-old Hanya. She is a year into her first job after graduating from a university that taught only English Language classes in her home town near Beijing. As our manager she contacted all the venues, making sure they had a driver waiting for us at each train station or airport. She bought all of our travel tickets, made all the hotel arrangements, and carried the cash to buy our meals and pay us. She taught us the correct pronunciation for some useful Chinese phrases and told us the exact moment we should walk out on stage. The first few nights she even timed our sets to make sure we played at least 90 minutes of music, just like it said in our contract! There were so many unexpected things. The burning spicy rice noodles in snail broth – with snail meats piled on top. The beautiful river walks in every city. The amount of trees in every city. The endless farms of new and under construction (30 story) high-rise apartments that look like Co-op city in the Bronx, 14 buildings in a cluster. The relentless honking of car horns. The incredible modern architecture in the business districts. The vast spaces of these new train stations with arrivals and departure levels. The wide open plazas in front of the halls where citizens would come out to dance in large groups at dusk. Someone would set up some big speakers and then people would line up rank and file and follow by imitation some dancing leaders. (Everyone facing the same direction – so you see what the dance leader does from behind.) The giant posters of us outside the theaters and in the lobbies advertising our concerts. The crazy amount of consumerism and shopping that is omnipresent. And since there is no shipping and everything is made in China – how ridiculously inexpensive everything is! What really stands out – besides what an incredible opportunity this was to play music and be treated so well – is how warm everyone was whom we connected with in any manner. People sitting next to me on trains who offered me food, audience members, store clerks, waiters, van drivers who wanted our picture taken with them, young musicians who came to hear us with their parents. Parents. Hotel desk clerks. Dancers in the public squares. From the sound of it – on those crazy teeming roads in traffic or on the train or waiting on lines – maybe you think that the Chinese are rude or inconsiderate. Maybe they just have different cultural norms than those we think of as good-mannered. But over and over again whenever there was any one-on-one interaction, or it was clear that you were making an effort to extend yourself, real warmth and effort to connect always followed. And besides, we have no idea what it might be like to live in a country with a billion people where only 30 years ago 80% of the population was rural – now it is split evenly 50/50 urban/rural. It is crowded and growing fast. Ultimately it going to have to be is clear to all of us that we already live on a planet of 7 billion and that we can and should live as if we know this greater truth….that of course we are all brothers and sisters.